Outsourcing is a strategic move that involves many risks and rewards. Its success depends being able to balance business, organizational, human, and technological considerations. While the main driver for outsourcing is typically cost savings, the process is also a major opportunity to improve other aspects, such as focusing the organization on its core business, service improvement, implementation of advanced technologies, accelerating organizational change, dealing with hard to manage IT personnel, etc. 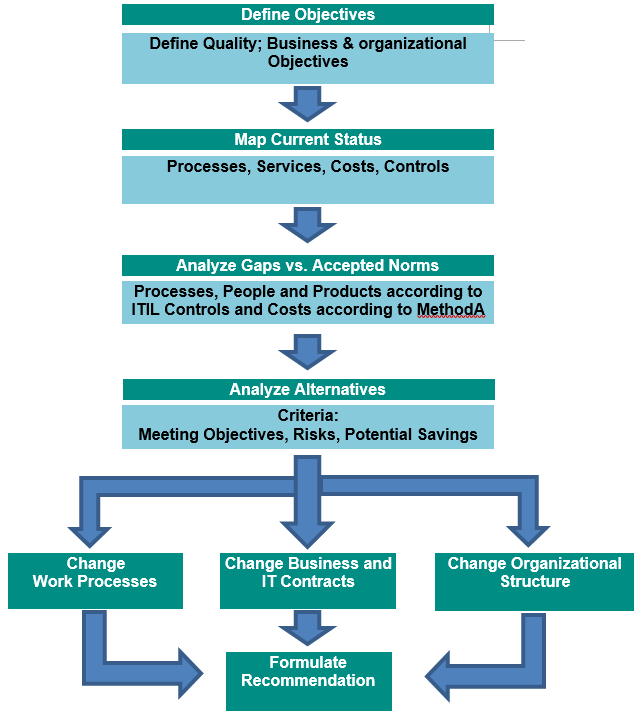 Outsourcing can take on many forms, from a complete transfer of an activity to an external contractor based on binding deliverables and SLAs, to managed services, an approach in which the contractor is responsible for all professional aspects and charges for deliverables or work batches, to nearshore/ offshore approaches, which are similar to managed services. Methoda has many years of experience consulting organizations through the implementation of varied outsourcing processes. Methoda's consulting covers the entire array of required activities from a managerial, professional, business and contractual perspective. The professional component includes unique aspects of outsourcing, such as statements of work (SOW), service level agreements (SLA), transfer of employees, pricing models, addition and subtraction mechanisms, transition periods, changes and upgrades, and more. Our advice is based on proven methodologies: MethodA for project management, ITIL for infrastructure and operations, and best practices, including templates, examples, tools, metric banks, procedure banks, SOWs, and more. outsourcing activities or renewal of existing engagements – preparation of a request for proposal/tender, assistance with supplier selection, and guidance and supervision during the transition period. As part of the tender, we may define projects to be carried out during the transition period, such as procurement and implementation of ticket management systems, command and control systems, telephony systems, and more. arbitration between the client and supplier in the case of a dispute. Outsourcing is a matter for professionals and experts! Let Methoda’s experience, reliability and objectivity help you.